Breaking News - Haitian Attorney Andre Michel is wanted for the murder of Student Frantzy Duverseau... Judge Lamarre Belizaire has just requested that he be taken to prison... Political persecution OR Justice being served??? Andre Michel whose name has been mentioned in the October 2010 murder of Haitian student Frantzy Duverseau became such a public enemy #1 of the Martelly administration that touching him means political persecution. « Haitian Artists complain about ENCADREMENT - Whose job is that? lwa tap pranl epi li tap mande pou la jistis ameriken fe limie sou zak saa. Etan k avoka Me ANDRE Michel koupab. majorite avoka an ayiti pa konn dwa yo e ni yo pa konn fe dwa osi. avoka pa ka bay pnh comandman pou aprehende ki ke c swa, e vwala li di ak bouch li k li "simpleman mande ofisye a pou arete yon endividi". Ala dekoze papa. Humm yon le ya jwen moun ki te touye Mireille Durocher, Gasner Raymond, Jacques Roches, Yvon Volel, Pasteur Sylvio Claude, Les freres Sansariq, Dr. Leine, Briyol Lindor, Jean Dominique, Felix Lamy. Hey hey. a la koze papa nan ayiti. Ah! Ah! Ah! Am kontan! 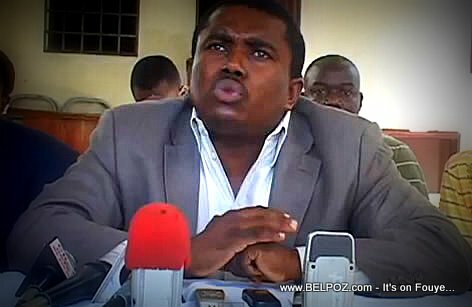 Prézidan Préval té pè manyen man-m zaboka ak jij dézòd yo; Prézidan Préval té pè bay pèp dézòd sa a mato pilon nan bouda yo, e byen men zépon nan pil bouda yo. Se pou sa la jistis la. Condane tout moun criminel lache tout inocent...Mwen ta rinmin we gouvernmen sa etabli yon sistem de criminel record database en Haiti.